Are you wondering “does attic radiant barrier work”? In this Radiant Barrier Guide, we have included the answers to this question and more. This guide is meant to illustrate a variety of information about reflective insulation and the best radiant barrier products on the market. This is also to help You (the consumer) understand the difference between all of the reflective radiant barrier products on the market, find out if/how they work, and which one will work for your desired application (Commercial or Residential). Use the links below to guide you to the section of this page you are interested in the most. PS: Your mind will be blown by the end of this post! Does attic radiant barrier work? Radiant Barrier VS SRX Cost Savings? Can we some radiant barrier reviews? What are some myths and truths about radiant barrier? Is installing attic radiant barrier worth it? In short Yes, Attic Radiant Barrier Does Work!! We only say radiant barrier doesn’t work because we know of a product that works even better and can save you over twice as much as current radiant barrier technology. Now there is a newer-better radiant barrier product called “SRX” SuperReflex. SRX Works Better Than Radiant Barrier! Our SuperReflex (Best Radiant Barrier Reflective Insulation Product On The Market) actually puts traditional radiant barrier technology to shame! It’s actually surprising that someone else didn’t create this product already. It’s a very simple design that solves all of the common problems with current radiant barrier technology: Dust, Moisture and Not enough energy savings to put money back in your pocket. What Is SRX & How Does It Compare To Radiant Barrier? Not only did The University Of Australia prove that our radiant barrier product has the lowest emissivity rating in the world (emissivity rating of 0.2) but our radiant barrier alternative insulation never loses its emissivity to dust – The most common problem with current technology. We solved that problem years ago and are still investigating ways to make it even more effective. AND, that’s before we install the German Attic Fans that kick your savings up to 20-50%, almost 3 times higher than current attic radiant barrier insulation. Receiving a $500 electric bill in Phoenix, Arizona is no shocker to most residents that live in the Valley. Let’s use $500 in a real world example of how much money you will save by installing current radiant barrier technology vs installing SRX (the best radiant barrier technology). The Department of Energy says, “radiant barrier is a highly reflective material that reflects — or emits — radiant heat rather than absorbing it”. The problem with current technology is the fact that “radiant barrier loses reflectivity due to dust“. Don’t reinvent the wheel, just make the wheel better! 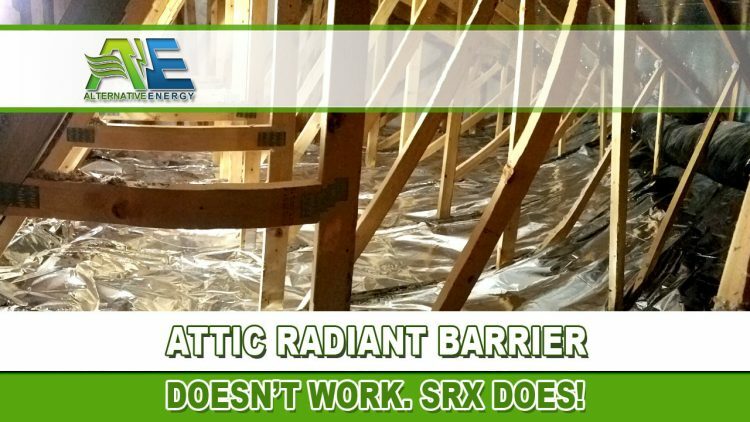 SRX is basically a modified version of radiant barrier, but better! SRX eliminates the biggest problem with radiant barrier today – Dust! Dust is a huge killer of radiant barrier and almost makes it completely ineffective in some cases. Sure you save a bunch of money at first but over the years, as the dust accumulates, your radiant barrier will stop working as good as it used to. This leaves you in the exact same situation as not having radiant barrier at all. Why spend all that money and be left with nothing to show for it after several years? SRX keeps working no matter how much dust is present. Areas like Phoenix, Arizona receive a generous amount of dust every year, leaving home owners who install radiant barrier confused as to why they even got it installed in the first place. We believe in our product so much it comes with an unconditional money back guarantee if it doesn’t give you the kinds of savings we are clearly stating. Low emitting Infrared surfaces are rated on something called an “E” Rating. Unlike the insulation in your home is likely thick batting which is rated with an R Value. E Rating measures surfaces that are able to keep their cool under heat. These surfaces are much better for “insulation” because they are simply deflecting or containing the radiant heat much like a thermos bottle does. For example: If a surface of something had an “E” Rating of 0.00, that would mean that surface was so reflective that heat has no effect on that surface at all. Of course, very few things in this world can make the list of having the lowest “E” Rating. The Graph below shows surfaces that have an “E” Rating and where each product ranks according to how low their E rating is. This graph clearly shows that SRX has a lower E rating than any material on the planet, much less radiant barrier. Radiant barrier isn’t even in the same ball park as SRX. You’re better off installing aluminum foil vs installing current radiant barrier insulation. As you can see in the E rating graph above, SRX has the lowest E rating of any material on the planet – meaning, it can reflect more heat than any other material or radiant barrier product in the world! 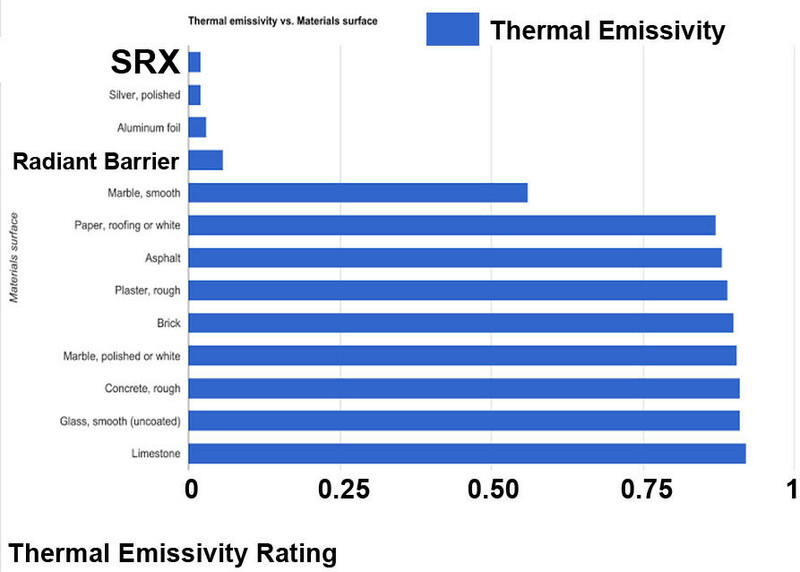 SRX’s “E” Rating is .02 Thermal Emissivity (Lowest In The World) far less than current radiant barrier technology. Now that we all understand what an E rating is and why it matters, let’s try to lay these radiant barrier myths to bed once and for all so we can finally understand how this stuff is supposed to work. MYTH: The best way to use a radiant barrier in a home in Arizona is to install some kind of foil-type reflective barrier stapled to the trusses in your attic. TRUTH: While this method of installation is one of the only two approved methods of installation there are a few things not being factored in this question. First of all, not all products are created equal, if you think so, then you might want to just staple some tin foil in your attic because that is actually better than some of the leading radiant barrier type products. Using a Thermal control membrane radiant barrier like this one LINK which has the lowest emissivity rating of any material, 0.02, rivaling only highly polished silver. Every other product has a rating of 0.25 or greater. See graph below to clarify. Second, this staple method is only for existing homes, there are far superior reflective products that are made for new build applications. Third, this is the most time consuming and most expensive way to install a radiant barrier, taking up to two weeks in some installations. It usually takes less than one day to install SuperReflex. Clearly you will spend more to have a group of installers at your home for 2 weeks in your attic multiplying the risk to your home and your wallet, versus a 1 day SRX install. MYTH: The type of radiant barrier that is laid on an attic floor will lose reflectivity quickly in Arizona because of heavy dust over time. TRUTH: There can only be one. Thermal control Membrane, the best radiant barrier product available, Is the only one in the industry that has a dust proof design. This myth is absolutely true, for all other Radiant Barrier products. However, The patented dual-mesh design of SRX allows you to simply lay out the barrier between the studs without using staples or glue The top layer acts as a sacrificial layer which will accumulate dust over time, however, just like a thermos bottle needs space, this material has a mesh layer and then a secondary layer of the same durable lightweight material. In this application with this patented design, this product is guaranteed performance forever with no affect by dust whatsoever. MYTH: The material should be installed leaving a space at the ridge and at the eaves; that way the heat can flow out of ridge vents or gable vents in your roofing. TRUTH: There is some truth to this myth. An attic does require some kind of venting solution when you install a radiant barrier. In more extreme climates like the desert, just having vents on your roof isn’t doing anything for the radiant heat trapped in your attic. Having a proper fan/vent solution is actually a very important part of radiant barrier installations that frequently gets overlooked. Installing a proper venting solution for your home is an absolute must in hot climates and will be different for everyone because of the different types of homes. Most homes in Phoenix, Arizona have only a few types of roofs, making a proper venting solution much easier and more modular. You must have at least one or two attic fans that are on a temperature triggered automatic switch. The fans must be on a specific side of your home in order to maximize venting (pulling cool air from the north side means you have to put your fan blowing out the south side and have some good vent holes on the north side to pull from. After a fan venting system is installed properly, all other holes like whirly birds and other vents and soffit vents must be covered up in order to contain the air flow in the desired direction of travel. MYTH: Radiant Barriers only work in Hot climates. TRUTH: False claims again on this myth. When talking about cold climates and containing the heat in your homes there are not very many radiant barrier products in this market yet. This is because of the moisture in colder climates. Radiant barriers can trap moisture in your attic because they don’t have any way to regulate the moisture. However, there is a highly reflective perforated radiant barrier specifically designed and tested on cold climates. The perforations insure that moisture emitting from the house will not condense below the membrane. Keep your heat in during the winter and out during the summer with this extremely innovative attic insulation product: This also eliminates ice dams! When you stop the heat from the house melting the snow on the roof ice dams cannot form. Simply roll this membrane out over your existing attic insulation to prevent ice dams, keep heat in and make every room in the house the same temperature. Oh, ya, and did I mention the manufacturer claims of dropping your heating bill by at least 30%. Don’t believe me? Check it out here. MYTH: You can buy radiant barrier material and put it in yourself, but it is important to put it in properly to get the desired result. Having the right radiant barrier correctly installed is vital. TRUTH: YES, of course. You can go to the hardware store and buy a reflective barrier off a roll and put it in yourself. You may want to consider having it installed by professionals and done properly. This is a product that could potentially cause house fires if installed incorrectly, especially if you have gas appliances or recessed “can lights” at home. Not all radiant barriers are created equal. Most claims by radiant barrier companies clock in at around 10% savings just on you’re A/C cost in summer time. That is not worth me getting out of bed in the morning to talk to one of these companies, sorry. That being said, there is a product that when installed correctly with a proper venting solution can reach entire power bill savings of more than 30% some up to 50%. Did that wake you up? I will get out of bed for those savings, especially living in Arizona where the homes are all grossly inefficient by design. This product is the longest standing radiant barrier product on the market touting more than a 25 year lifespan. MYTH; a homeowner with a bunch of R-30 to R-38 insulation probably won’t get much more help from a radiant barrier. It is more cost effective to upgrade your insulation. TRUTH: FALSE AND FALSE. This is a trick question right? You have insulation in your attic, why would you need a radiant barrier too? Why not more insulation? I will tell you why. Have you seen your insulation in your walls and in your attic? It is a thick “cotton fluff” material. What does that matter? Well, If you live in a hot desert like Phoenix, AZ you may want to consider this question. What do you think would happen if you wore a thick sweater in the middle of summer? That is how your house is designed; it has a thick sweater on it that keeps the heat in the walls and ceiling long after the sun goes down. The building codes all come from the East coast where the homes are designed to keep the heat in. They just decided to throw a huge AC unit on the home now to keep it cooler. By a massive oversight this metal box gets connected to a 150 degrees metal elbow that goes directly on top of your roof that gets up to 200 degrees in summer. This air handling is now system struggling to distribute cold air through your 180 degree attic. Do you see the inherent problems here? THE BIG MYTH: The real question about radiant barriers, as with any insulation, is whether it warrants the cost. From a pure return on investment standpoint, radiant barriers are not the place to start saving on your cooling bill. Even though everyone agrees that it provides at least some savings on air-conditioning. SRX was featured on ABC’s EXTREME HOME MAKEOVER, click on the link to watch the video. UNIVERSITY Of Western Australia Confirms TEST: LOWEST EMISSIVITY (HEAT RETENTION) OF ANY MATERIAL IN THE WORLD. (0.02 E RATING) The same rating as highly polished silver. The only product to have this kind of warranty; “SRX has an unconditional, money back guarantee. If you pay cash and are not completely satisfied with this innovative energy conservation product, simply return it for a full refund. If you are shopping for a radiant barrier or reflective insulation product, ask for the validated testing, a performance warranty and if it works when covered in dust. SuperReflex (SRX), is the only available dust proof thermal radiant barrier. SRX Radiant Barrier is an extremely effective way to increase comfort, reduce consumption and keep rising energy bills in check. SRX was chosen to be installed on ABC’s Extreme Home Makeover for the Yazee family in Pinion Arizona. SRX has allowed multiple architects to win awards for the efficiency of their projects. Faraday Protection: All SRX products offer excellent Faraday protection which protects sensitive electronic and computer based equipment from EMP or unwanted electromagnetic fields. By pre-cooling a home (in hot climates) and shutting off the a/c when expensive on peak hours start, significant reductions in energy costs can be obtained. Conventional insulation cannot stop the influx of heat during on peak hours and by 3pm the attic heat has reached the ceiling. SRX keeps the insulation much cooler which allows the a/c system to be turned off and “coast” until Off Peak times starts (typically 7pm or 8pm). With the air conditioning off during On Peak hours (this is the only time demand is charged), and an inexpensive water heater timer to keep the 5kw hot water tank from running during On Peak times, the cost of an expensive load controller can be averted and in reality, have lower demands than with a home energy management load controller. Is Attic Radiant Barrier Worth It? We hate to be biased but if you are planning on going with any other radiant barrier in the world besides SRX, then no attic radiant barrier isn’t worth it! Let us prove to you below why SRX radiant barrier is worth it! 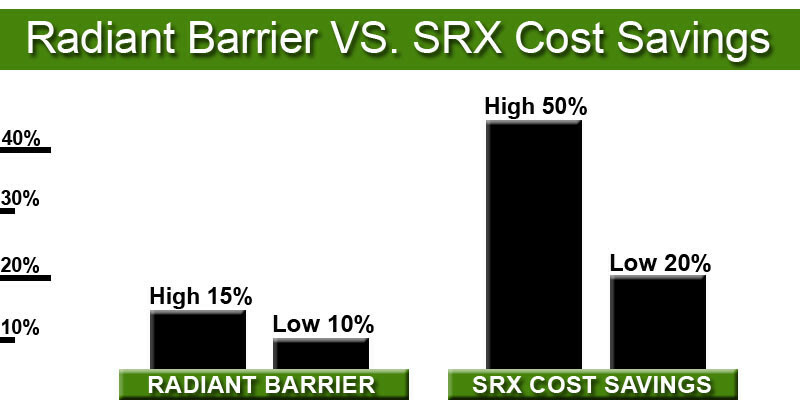 Save as much as 25-50% guaranteed by installing SRX in your home! Contact Alternative Energy, LLC/Power Solar today at (602) 510-4932 or fill out our short contact form.